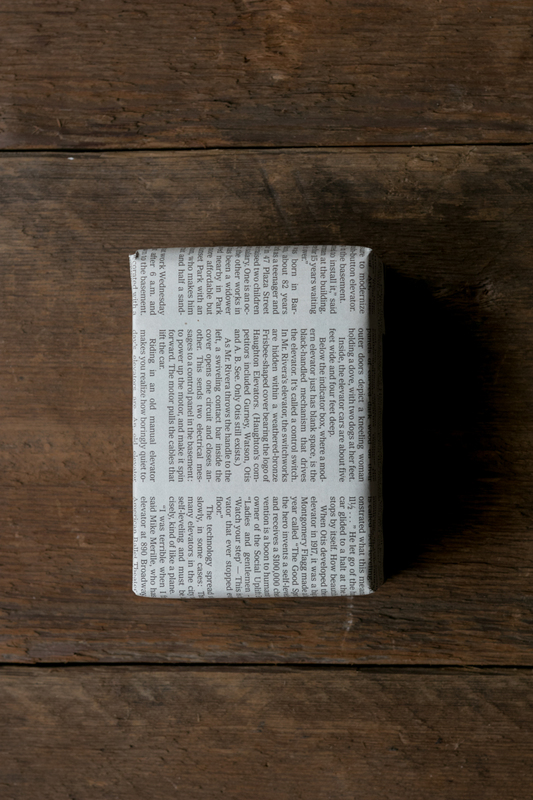 To this day, I maintain that old newspaper is the most perfect way to wrap a gift. The act is brilliant, and not just to an eight year boy. It's subversive. It's free. It's eco-friendly. And it looks infinitely cooler than anything available on a roll from the discount store. "Who has a newspaper lying around anymore?" Fair enough. I certainly don't. Physical subscriptions are certainly down, and for most of my generation and younger, we've literally never had a local paper delivered to the house. But that's no matter. Your city has a free alt weekly, a neighborhood bimonthly, and all sorts of newsprint publications you can get your mitts on easily. And to obtain is worth it, because the vibe is just. so. perfect. Newsprint has a texture that comes alive when cornered and taped around a box, and the look is clean yet worn in, just enough. This doesn't communicate carelessness. It oozes confidence from every fold and swath of Scotch tape. It's 2017, and wrapping a gift in newspaper does not detail that you're not thoughtful enough to keep commercial gift wrap on hand. Rather, newsprint communicates you most certainly do have a whole box of snowflakes and candy cane stripes and all the trimmings sitting around, but that you're making the specific choice to offer it like this instead. No bows. No ribbon. No gift tag. It's all intention, but presented effortlessly. 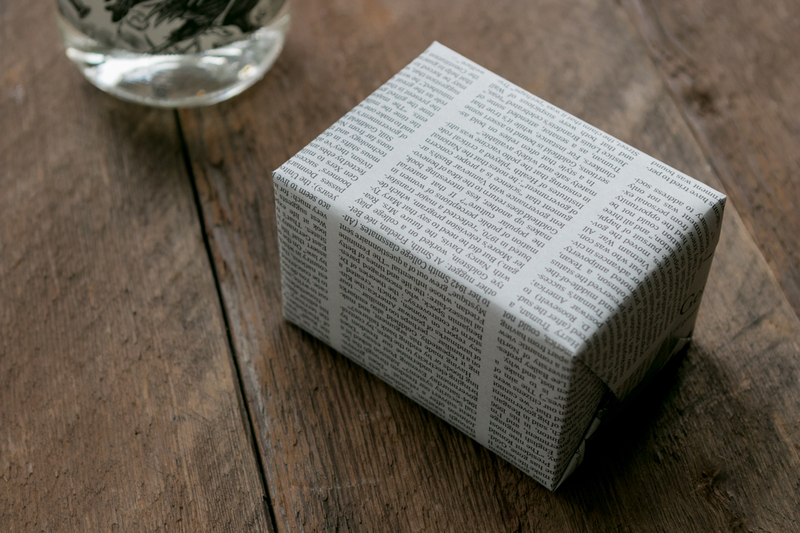 It's utilitarian nonpareil, and therefore as cool as gift giving can get. And for my money, even more thoughtful. A great idea. When my kids were young, they liked wrapping gifts in the comic of the newspaper. It kind of fell out of use, but I think one reason to go back to doing this, is that in some areas (mine included), gift wrap is not recyclable, but newspaper is. Good reason! We all need to recycle! My mother has been doing this all of my 56 years. The cool part with the funny papers version is showing that you've noticed what comic someone else likes, especially over the years. When i was little, it was Peanuts. When I was a teenager it was Motley's Crew and Doonesbury (I was THAT kid). When I was in my 20s-early 30s, it was Bloom County and Far Side. Since the 90s, it's been Non-Sequitur and back to Doonesbury. So it's been fun to see that my mother has noticed how I've changed (or didn't) over time. Hers were always Henry, until that strip died. After that, I used Blondie or Fred Bassett. Just found this article. My other favorite wrapping paper.... old maps. National Geographic magazine definitely has good ones, but any map will do. I usually use the funny pages to wrap a few gifts, but recently the section has been getting smaller, so it's reserved for mini gifts. I took this idea to heart and used a color grocery store flyer. It happened to have a Merry Christmas greeting on it, so much the better. Seems more sensible to use newspaper wrap since it just gets ripped open and discarded in seconds anyway, and it's the contents that count. I agree with this 95% - the other 5% being presents that are BIG, in which case using multiple sheets looks a little cheap. I'm sure there are exceptions but this technique seems to work better for smaller gifts. How will you know who it's to or from?? i still try to use color sunday comics for my message forum secret santa gifts. unfortunately, our local paper quit printing comics altogether, so i have to scramble to find some. also, the header print drops a subtle hint of who the the recipient's secret santa might be if the recipient can figure which forum member is from the same place as the wrapping paper.